Acceleration of technological developments: The Amish are interesting – they spend a great deal of time thinking about technology, exploring it, sensing it – before allowing it to enter their lives, and therefore reshape it forever. For the rest of us we run full tilt into the new pushing the edge, not just technologically but more equivocally; socially, spiritually, economically. And perhaps it has ever been thus. Our deep relationship with technology is often over-looked, as Benjamin Bratton observed, those entanglements of technology and culture, how technologies enable the making of certain worlds, and at the same time how culture structures how those technologies will evolve, play a critical in what next looks like. So here are a few thoughts: technology only succeeds when it meets fundamental human needs, new tools therefore reshape societies – think Gutenberg, or the mobile device, code and DNA will merge, new tools pulled on hard by humanity create power shifts and power vacuums’, humanity will consistently seek to interface with the world in new and powerful ways. It is our gift and our curse. Robotics is on the cusp of reshaping our world – in every aspect of our lives, from the waiting rooms of our hospitals to our battlefields, disaster prone world and our everyday lives. For good and for bad. The Google-owned Japanese robotics company SCHAFT has won the DARPA Robotics Challenge Trials by a wide margin. It scored 27 out of 32 points, beating its nearest competitor IHMC Robotics by seven points. More remarkable is that Google has bought eight robotics companies. Its most recent purchase is a company called Boston Dynamics, it has created a mechanical mule called Big Dog – it walks, runs, climbs and carries heavy loads. It’s the size of a large dog or small mule/donkey – is approx 3ft long, 2ft 6in tall, weighs 240lbs, has four legs that are articulated like an animal’s, runs at 4mph, climbs slopes up to 35 degrees, walks across rubble, climbs muddy hiking trails, walks in snow and water, carries a 340lb load, can toss breeze blocks and can recover its balance when walking on ice after absorbing a hefty sideways kick. What drives the Google founders is an acute understanding of the possibilities that long-term developments in information technology have deposited in mankind’s lap. Computing power has been doubling every 18 months since 1956. Bandwidth has been tripling and electronic storage capacity has been quadrupling every year. Put those trends together and the only reasonable inference is that our assumptions about what networked machines can and cannot do need urgently to be updated. Most of us, however, have failed to do that and have, instead, clung wistfully to old certainties about the unique capabilities (and therefore superiority) of humans. Thus we assumed that the task of safely driving a car in crowded urban conditions would be, for the foreseeable future, a task that only we could do. Similarly, we imagined that real-time translation between two languages would remain the exclusive preserve of humans. And so on. 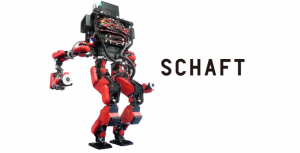 Below is SCHAFT in action.